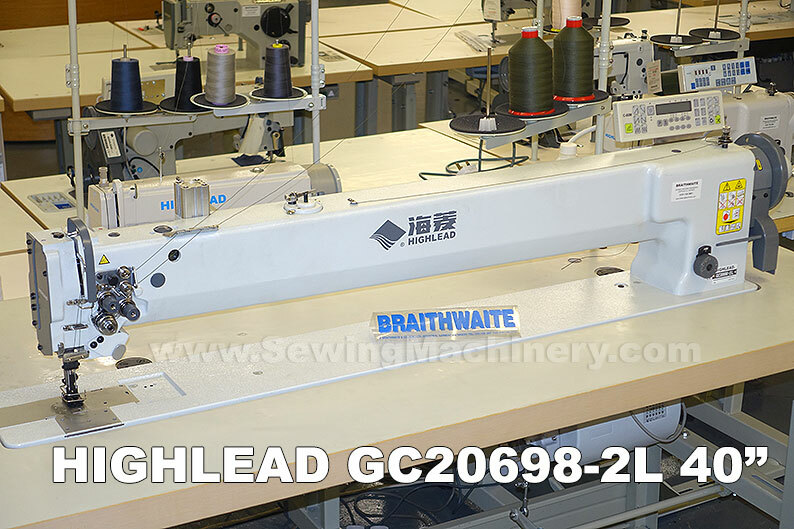 The GC20698-2L40 is Highlead's super long arm twin needle walking foot industrial sewing machine. This extra long sewing machine allows up to 40" (1020mm*) clearance to the right of the needle, which is approximately 4 times the clearance of a standard arm machine. It features a triple feeding action by way of: bottom feed, needle feed +walking foot top feed and is fitted with 2x large vertical axis hooks & bases for use with medium to heavy weight materials. The machine is equipped with electronic needle position which automatically puts the needles in an UP or DOWN position (selectable) at the end of a sewing cycle; considerably reducing the need to use the manual hand wheel. The function is of particular use on this extra long arm model as the hand wheel is 4 time further away from the stitching area, when compared to a standard model. The included full size heavy duty servo motor is a high torque version with an electronic control system licensed by Mitsubishi. It is energy efficient and rotates only when you are actually sewing; if you pause or stop the motor stops immediately. A knuckle operated reverse device, which is positioned just above the foot, allows the operator to reverse stitch without having to move their hands from the sewing area. A push button electronic control panel allows different stitch count functions. For example an operator can set a number of stitches (up to 99) and the machine will stop automatically when the set amount has been sewn. Programmable automatic back-tack stitching reduces the need to use the manual reverse lever and can save time. This function is easy to switch on/off, with the option of start and/or end auto back-tacking. A pneumatic auto foot lifter device and air connection kit are fitted for easy loading/unloading reducing operator fatigue. 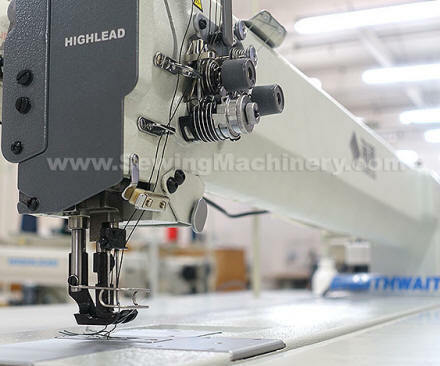 The Highlead GC20698-2L40 is an extra long arm, needle feed, walking foot machine, for use on medium to heavy weight materials and is aimed at job applications where a conventional standard arm or normal long arm sewing machine would not be suitable or long enough. Examples: Large covers, upholstery panels, car trimmings, awnings, tents, parachutes, gliders, hot air balloons, sails, pool cover, flags, top stitching leather etc., + many other large items.